Having carefully studied samples of mirror heads from several manufacturers, we were surprised at the differing levels of quality. Naturally, we have chosen the best and these are in stock. Early mirrors had no Lucas medallion although we only stock the later ones, fully engraved and which show the Lucas medallion as this seems to be the enthusiasts general preference. We also stock, the side mirror arms for both the driver and passenger side mirrors. Whilst T Type models generally used both arms, the early F and J Types had no provision for a driver's side arm let alone the passenger's side. We have been advised by some of our overseas customers that a passenger's side mirror is mandatory on today's roads even for cars where these were not originally fitted to that particular model. We also supply scuttle and horn button mounted mirrors as well as the late J2, F2, L2 windscreen supports which accommodate the driver's side mirror arm. 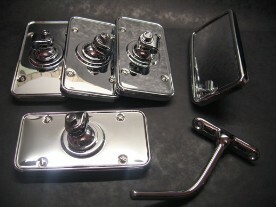 These mirrors can also be used with the VMGP Lucas Style Triangular Mirror Bracket. Please beware, that factory seconds are occasionally being advertised for sale through Ebay power sellers and are not being described as 'seconds'.